I can't seem to wrap my head around all of the things that this book...WASN'T. I have never before, in my entire reading existence, read a book that involved ZERO conflict. There was inner conflict in here, yes, as one character undergoes a hysterectomy. But even THAT was written with sunshine, rainbows, and lollipops dancing in the background. I was dumbfounded, and so disappointed with what I found in Driving Lessons. However, as per usual, these are my personal opinions, because this book could very well be the perk that YOU need to get you out of a winter slump: a neat little drama-free soap opera of a book. 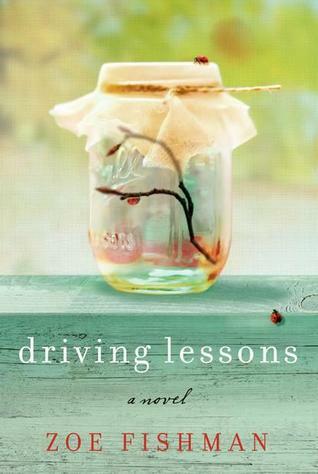 As the synopsis points out, Driving Lessons is a narrative about 3 woman (plus some female side characters), "navigating" their way through life, and it's small surprises. I won't delve too much into the plot, because anything I say might very well give away the entire thing: this book could have been written in 150 pages or less, seriously. The story is mainly centered around Sarah, who, along with her husband Josh, uproots her life and moves from New York, to a small town in Virginia. She then receives some bad news regarding her best friend Mona, hightails it back to New York to take care of her, and ends up spending some quality time with her sister-in-law, Kate, as well. In the end, she receives some great news. That's it. That's all. I've pretty much described the entire book to you. There were no LIFE-ALTERING secrets revealed. No one was betrayed, no one was abandoned, defeated, depressed or even remotely in danger *SIGH*. When I started a new chapter, or read a line that (I thought!) held some guarded truth, I kept thinking "okay..okay this is it guys!! NOW the author is going to drop some bombs! Some real HEART-HITTING twists! I just KNOW IT!". And then..........nothing. Nothing until the very end, and then nothing there either. I was absolutely losing my MIND over the sheer nothingness that was happening. The characters in Driving Lessons were completely one-dimensional, and could have all been the same person to me. Their voices were so alike, my eyes glazed over almost all of the dialogue. Sarah's husband, Josh, could have been the one getting a hysterectomy for all I know, he was THAT interchangeable with her best friend, Mona. He was unrealistically written, which infuriated me to no end. Seriously, what man is THAT perfect? Give me a break. I want to escape reality when I read, but I'm not in favour of becoming delusional. I will refrain from sharing my thoughts about the main female lead, Sarah. Let's just say that when I got to a scene where she completely refused to become someone's friend because they were "too pretty", I was literally ready to close the book for good. Overall, Driving Lessons followed a linear path, a safe and, maybe for some, a comfortable pace. It's a book you might pick up if you've just overcome an emotionally trying time, and you just want something that's free of any negativity, or intense drama. There IS the issue of cancer in this book, so if that's a touchy subject for you, maybe steer clear. However, it was written about in a way that barely grazed the surface of the emotions, and procedures, involved. Recommended for fans of: Elin Hilderbrand, Debbie Macomber, Women's Fiction, "Chick-Lit", Adult Contemporary. oe Fishman is the critically acclaimed author of the upcoming Driving Lessons (Morrow, April ’14), Saving Ruth (Morrow, May ’12) and Balancing Acts (Harper, March ’10). She worked in the New York publishing industry for thirteen years in the editorial department of Random House, the rights department of Simon & Schuster and later, as an agent for two boutique literary firms before moving to Atlanta in August of 2011 with her family. She's currently at work on her next novel, freelance editing, and teaching writing at Callanwolde and The Marcus Jewish Community Center of Atlanta.